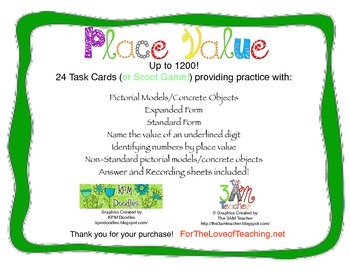 Place Value Task Cards (or Scoot Game) up to 1200! 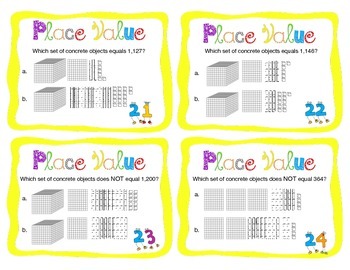 This set of 24 task cards provide place value practice up to 1200. Cards 1-4 ask students to determine the value of a set of concrete objects (or pictorial model), then write the number in expanded notation. Cards 5-8 ask students to name the value of a number when told how many thousands, hundreds, tens and ones are in the number. Cards 9-12 ask students to name the value of an underlined digit. Cards 13-16 ask students to represent a given number in expanded form. 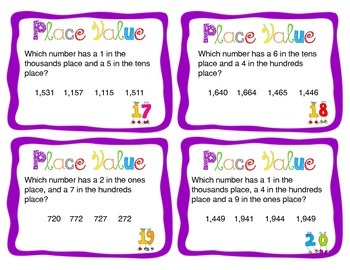 Cards 17-20 students are asked to determine a number when given the place value out of order. Cards 21-24 ask students to determine which set of concrete objects (pictorial models) presented in non-standard form do or do not represent a given number.